Add personal style to your look with a silver concho belt. In the photos, you will see different style conchos that are placed on 1 1/2" western leather belts. 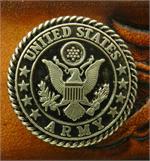 At GavereLeather.net, we have many styles and sizes of silver and gold colored conchos for you to choose from. 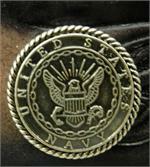 Our styles include silver and gold colored cross conchos, buffalo nickel, longhorn oval, and specific military branch emblems. 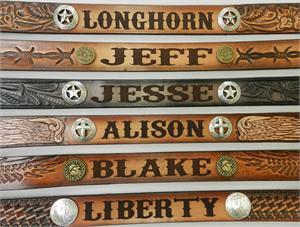 Personalized embossed leather name belts look especially nice with a concho added to each side. 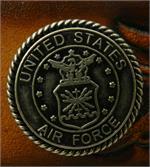 All of our coin conchos at GavereLeather.net are well-made and exceptionally realistic in person. 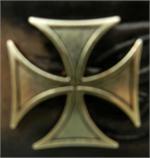 The most popular placement of conchos is across the backside of a leather belt. You can use 4 or 6 conchos placed 6” apart from each other across the backside. Browse our assortment of conchos. You’ll be sure to find one from our selection that goes perfect on your personalized embossed leather belt. Compliment your belt with conchos. Conchos are on a 1 1/2" belt in photos. Many styles and sizes to choose from. Coin conchos are extremely realistic. Name belts look especially nice with a concho added to each side of the name. 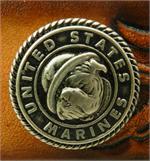 Most popular placement of conchos for belts uses 4 or 6 conchos placed six inches apart across backside of belt.